Plot – In the aftermath of World War 2, a group of German POW’s are placed under the supervision of Danish Sgt. Carl Rasmussen (Møller) and tasked with clearing out thousands of active landmines from a significant section of Denmark’s coastline that were placed there by the German’s at the height of the conflict. Just when you think you’ve seen all there is to see concerning World War 2 and big screen stories, along comes a film shining a light on an aspect of the war that I would imagine very few know much about. Oscar nominated Danish/German film Land of Mine delivers a non-fictional narrative of a true life aspect of World War 2, that being upon the conclusion of fighting during the great war, German POW’s (mainly young soldiers) were harnessed by the Danish army to take on the arduous and literally explosive task of disarming over 2 million mines that had been left scattered across the coastline of Denmark at the height of the World War 2 conflict. 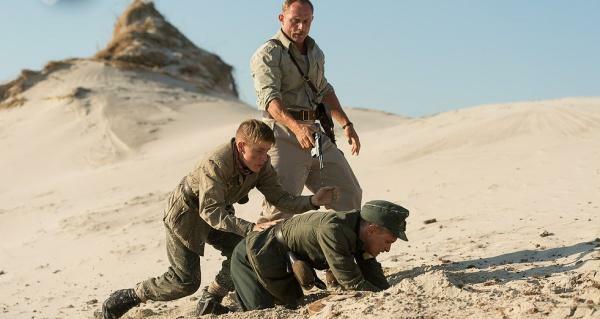 This little known (at least here in Australia) aspect of post-war Europe allows director Martin Zandvliet a chance to deliver some white knuckle big screen action as our rag-tag group of young German POWS go about their business of clearing out a section of Danish coastline under the often brutal care of Roland Møller’s Danish Sergeant Carl Rasmussen. Land of Mine cares very little for adding much backstory or humanising any of these characters for us, we know and understand that what these men and boys on both sides have been through would be nothing short of horrific and instead Zandvliet places us alongside the group as they face a day to day proposition of death as their month long journey to find and disarm mines consumes their day to day lives. You’re never under any confusion as to what this task required and it’s one of those interesting conundrums as to whose lives were more important as the Danish saw an opportunity as such to get revenge on the German’s that had caused so much pain for them, even if many of the POW’s tasked with the mine clearances quite clearly were not often at fault. It’s a little bit of shame that we don’t get to know these characters better as Zandvliet’s film pulls no punches when it comes to showing the true bloody nature of the task these individuals undertook but despite the fact Land of Mine’s cold approach doesn’t allow it to connect to us as emotionally as we could’ve done with, as an examination of a shocking aspect of post-World War 2 and an insight into a different facet of the war in Europe, Land of Mine is a real must-see. A confronting, shocking and sometimes unbearably tense war drama, Land of Mine is a war film like none other and while it never pulls off a true emotionally resonate connection, this foreign language effort is well worth digging up and one of the more impressive war films of recent years.